Getting a chipped windscreen repaired has never been easier. Crown Windscreens can repair an existing windscreen quickly and cost effectively. Crown Windscreens technicians will always try to repair damaged glass whenever possible to save you both time and money. 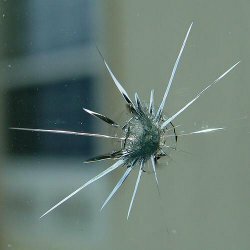 In some cases your vehicle glass will be beyond repair, but as long as the chip is no bigger than a 20 pence piece we can repair it using our glass repair kit. As a small windscreen chip could cause your windscreen to crack or lead to cars failing the MOT Test, its vital to repair windscreens to an acceptable standard before your MOT assessment. Crown Windscreens can repair chipped windscreens to British Standard BS AU242a:1998 so windscreen repairs are flush with the surrounding glass and almost invisible. The MOT specifies a windscreen area within the drivers immediate line of sight, known as ‘Zone A’, where any crack or damage must be contained within a 10mm diameter. It also states that any combination of minor damage that seriously restricts the drivers view will fail the MOT. In addition to this area of windscreen, MOT guidelines require any chip or crack within the remainder of the area swept by the wipers to be contained within a diameter of 40mm. If there is any doubt as to whether a windscreen will pass or fail the MOT, or concerns over the safety implications of any damage, a quick call to Crown Windscreens for a FREE inspection will quickly put your mind at rest. If action is required, Crown Windscreens offer an approved repair system that offers average cost saving of 70% compared to the replacement cost of a windscreen. You can help to prevent your windscreen becoming scratched by regularly changing your wipers. Contact Crown Windscreens on 0800 158 8388 for windscreen wiper replacement fitted by one of our expert technicians for no additional charge.